Life Stirred Up: Shop Your Way: Win a Pink Tool Box! 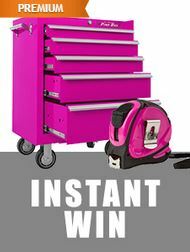 Shop Your Way: Win a Pink Tool Box! Wow! I would love to win this cool pink toolbox to put all some of my craft supplies in. What would you store in this colorful beauty? Click the link to be taken to the Shop Your Way rewards site and enter. You can enter once per day.